(Vulpes vulpes) Red foxes come in many different color phases, anywhere from a light yellow to a black phase. They remain this color all their lives. All red foxes have a white tip on their tail. What do Red Foxes eat? They are omnivores and will eat just about anything. How long do Red foxes live? In captivity they live about 10-12 years. They can have anywhere from 1 to 12 kits at a time. Red Foxes are found throughout most of Europe, Asia and North America. Red foxes come in many different color phases, anywhere from a light yellow to a black phase. They remain this color all their lives. All red foxes have a white tip on their tail. They have the widest distribution of any of the canids and can be found in a wide range of habitats. 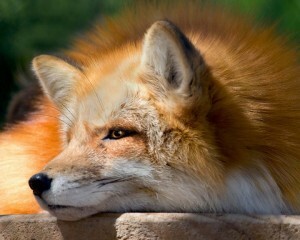 Red foxes were not considered indigenous to North America and could not be released back into the wild at the time. There may be an indigenous population that has been found in the Sierra Nevada range recently, but more research needs to be done in order to be sure. Pippen – A male fox who came to us in 2007. Pippen also came to us as a tiny baby and was hand raised. He was born in captivity at Wolves and Company in Hesperia, CA.